Gibson Style A-1 Snakehead Model Carved Top Mandolin (1924), made in Kalamazoo, Michigan, serial # 75720, black top, dark stained back and sides finish, birch back and sides, spruce top, mahogany neck with ebony fingerboard, original black hard shell case. 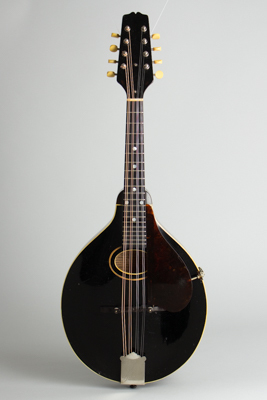 This is a great-playing and sounding original Style A-1 mandolin from early 1924, the peak of the "Loar era" at Gibson. These "Snakeheads" are generally considered the best-sounding roundhole "A" style mandolins ever made, and this one certainly bears this out. This is a fine example of Gibson's craftsmanship at the apex of the mandolin era, just before the company's focus shifted to banjos and then guitars. These "Snakehead" instruments are named for their Loar-designed peghead that angles inward towards the tip, a feature inexplicably abandoned by Gibson some time after he left. They are revered for their unmatched tone and projection and have the other newly-introduced advanced features of the era including the adjustable truss rod neck, raised adjustable bridge, and very slim neck profile. The top on this A-1 bears a striking black lacquer finish, bound in white celluloid with a thin double inlaid wood soundhole ring. The tortoise celluloid pickguard is held with the transitional side bracket clamp. The tailpiece has the engraved "The Gibson" cover plate and the tuners are Waverly strips, features unchanged from the 1910's. These distinctive "Loar era" A mandolins have become ever more sought-after by discerning players. Lloyd Loar's tenure as acoustic engineer at Gibson has become so mythical that sometimes separating fact from fiction is difficult. Certainly the mandolin family instruments made during the period of his employment are the most perfectly realized in Gibson's history, and have become the template for most similar instruments since. The mandolins of the "Loar era" show the influence of a master player on both design and execution, although other Gibson employees (especially Thaddeus McHugh and Lewis A. Williams) actually engineered many of the technical improvements of the early 1920's. Loar was primarily concerned with 'voicing' the instruments properly; the Master Model Style 5 line was his greatest contribution with their violin-style F-hole tops, but all Gibson mandolin family instruments were refined and improved at the same time. Even this most basic "A" model has sonic and playing improvements benefitting from "Master Loar's" input that are still evident today, nearly 100 years on. Overall length is 25 3/4 in. (65.4 cm. ), 10 in. (25.4 cm.) wide, and 1 7/8 in. (4.8 cm.) in depth, measured at side of rim. Scale length is 14 in. (356 mm.). Width of nut is 1 1/16 in. (27 mm.). This is a very good playing and sounding "snakehead", with some wear but all original except for an old clear lacquer overspray on the body only. The finish shows dings, small scrapes and some touchup-the instrument has been played quite a bit since the finish work was done. All hardware is original and intact including the tuners, tailpiece and cover and the pickguard and clamp. The frets have some light wear but the mandolin plays very well, sounds spectacular, and still resides in its original HSC. Very Good + Condition.